View of the Notre Dame cathedral on Tuesday after Monday's fire in Paris. A Paris judicial official said investigators have questioned about 30 people since the fire, mostly employees working on the restoration project, the AP reported. The official said the cathedral’s fire alarms sounded twice on Monday evening. The first time, some people, including a fire official permanently working on the site, went to check under the roof and saw nothing. The second time it was too late because the fire was too strong, the official said. French Minister of Culture Franck Riester said many priceless works of art in the cathedral were saved and that Notre Dame’s organ had survived. He said firefighters rescued the church’s two most hallowed relics: a tunic worn by St. Louis, a 13th-century French king, and a crown of thorns that is revered as the one Jesus wore when he was crucified. 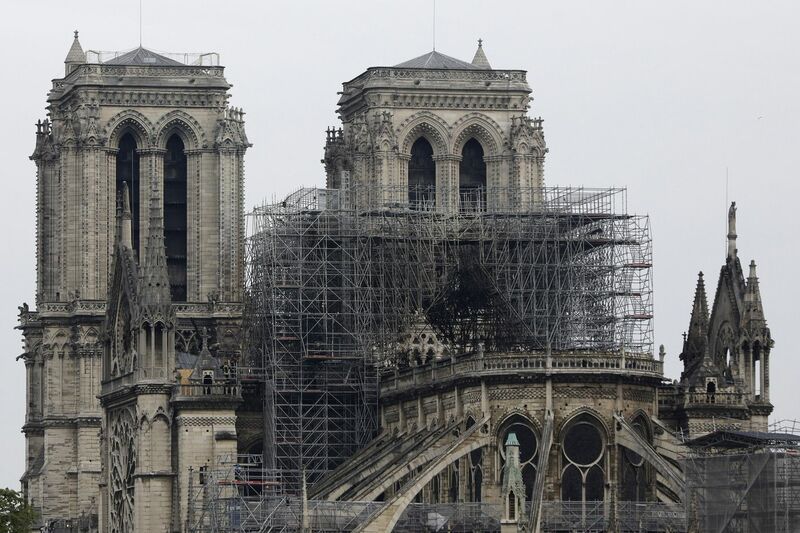 André Finot, a cathedral spokesman, said the cathedral’s precious stained-glass rose windows, which date to the 12th and 13th centuries, are also likely intact. The Rev. Jean-Marc Fournier, chaplain of the Paris Fire Brigade, has been identified as the person who saved the crown of thorns and other items. The French Bishops’ Conference says that the bells of the country’s 103 cathedrals will ring Wednesday at 12:50 p.m. Philadelphia time, the hour when the fire started Monday at Notre Dame, in a show of solidarity. Hidalgo tweeted a photo of the interior of the cathedral.